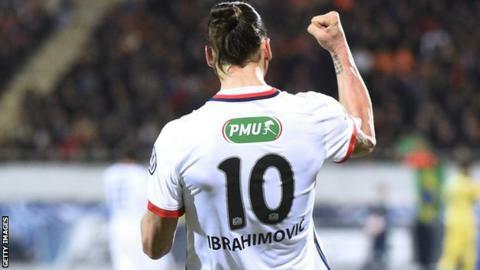 Zlatan Ibrahimovic scored his 43rd goal of the season as Paris St-Germain booked a place in the French Cup final and kept up their bid for a back-to-back domestic treble. Ibrahimovic collected a pass from Angel di Maria, shrugged off two defenders and scored from the edge of the area. PSG will now play either Sochaux or Marseille in the final. Laurent Blanc's side are already Ligue 1 champions and play Lille in the League Cup final this weekend. Last season they won the league by eight points, thrashed Bastia 4-0 to win the League Cup and beat Auxerre in the Cup final to seal the clean sweep.